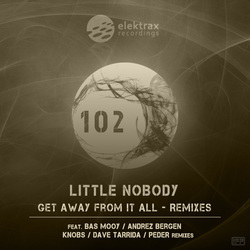 Get Away From It All - Remixes. IN CONJUNCTION WITH GYNOID AUDIO. This debut 12” on new Australian label Gynoid Audio in conjunction with Japanese label IF? comes from ex-pat Aussie IF? label head Andrez Bergen under his Little Nobody guise and packs in three excellent reworkings of his 'Metropolis How?' track. 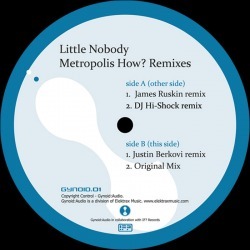 In its original mix form, 'Metropolis How?' sees Bergen opting for a pared-back but still formidably metallic techno path that fuses steel-hard snare programming with writhing waves of sub-bass to stellar effect, before DJ Hi-Shock's remix gets generous with the burbling 303 bass, sending dubby snare crashes back and forth between the speakers as the clicking rhythms roll beneath. On the flip, I personally found James Ruskin's reworking the highlight here with its tumbling electro bassline and sudden breakdowns, while Justin Berkovi closes things off with a remix that's geared far more towards dark, sinuously funky tech-house vibes. An impressive remix EP that's well worth tracking down.